Well, following the success of 1983 new team manager/promoter Colin Pratt had the unenviable task of getting the team to within the 48 point limit. The Heathens were forced to transfer Simon Wigg to Oxford, release Peter Ravn to Wolves and to loan Jan O Pedersen to Sheffield. Colin kept Erik Gundersen, Lance King, Phil Collins and Alan Grahame a great top four but their combined average was 37 points giving him very little scope to make up the team. He signed Mike Wilding from Birmingham, Finn Jensen from Leicester and brought in Steve Collins the youngest of the famous brothers at reserve despite his limited experience. He was hoping to fit in the very talented Simon Cross but was not able to fit him in until the new green sheet averages came out in May. Mike Wilding was the one to go, transferred to Scunthorpe this brought about a big improvement in the Cradley side. During the opening weeks of the season Cradley had shocked the speedway world by beating Belle Vue home and away to take the Premiership Trophy, however the League Cup showed up the weakness of a very long tail and were lucky to reach the semi-final. In the League they began their defence of the title by losing to Wimbledon home and away, that home defeat was a bitter pill to swallow as it was their first home defeat for six seasons - a British League record dating back to March 25th 1978, 93 consecutive league victories at Dudley Wood. 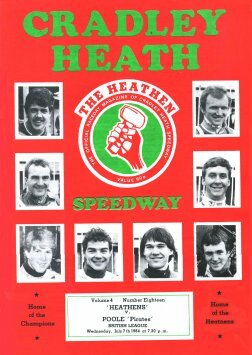 Gundersen was a late arrival missing five of the first seven matches and with Simon Cross drafted into the side it all changed and the Heathens were on the Championship trail once again. After a tremendous run they lost at Ipswich and Reading in October and dropped another point at home to Ipswich after a real tussle. They also lost to Ipswich in the KO Cup round 2 but went on to win the League Cup defeating Belle Vue in the Final. They also won the Midland Cup beating Swindon home and away in the Final. 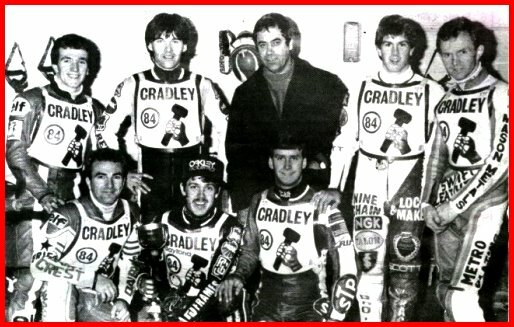 Cradley's season though was dominated by Erik Gundersen. Erik won the Individual Long Track and speedway World Finals and also picked up a third Gold Medal as a member of Denmarks winning World Team Cup side. He finished the season by winning and retaining the Golden Helmet and almost retained the British League Riders Championship finishing runner-up after being excluded for a tape offence in the run-off for the title. He climaxed a great year by being voted Denmark's Sportsman of the Year after a Nationwide poll. Lance King sparkled too, winning the Overseas Final of the World Championship and finishing third in the World Final itself after losing a run-off with Hans Neilsen. 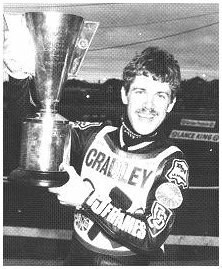 Alan Grahame also had his moments being a worthy winner of the Golden Hammer and qualifying for the World Final at reserve and scoring five points from his two rides. statistics taken from the Cradley Speedway database for BL matches only. The Swindon v Belle Vue match was finally abandoned after three attempts were made to run the meeting - each one being rained off. Finn Jensen 6, Simon Cross 5, Mike Wilding 0. Finn Jensen 5, Phil Collins 1, Bill Barrett 0. Following in Bruce Penhall's footsteps in 1981 and 1982 Erik Gundersen stepped up to the rostrum to take the 1984 World Championship at Sweden's Ullevi Stadium in September. Lance King joined Erik on the rostrum too in third place. It was the icing on the cake for Erik who had earlier become World Long Track Champion and won a gold medals as part of Denmark's World Cup winning team and World Pairs. He rounded off the season by winning and retaining the Golden Helmet, he won the Danish National Championship and was voted Denmark's Sportsman of the year. Web site created and maintained by Steve & Phil Johnson. E-mail us your comments and suggestions. The views expressed are those of the author and not necessarily those of Cradley Heath Speedway. Copyright: Steve Johnson & Cradley Heath Speedway Ltd. 2006.